What does this mean for your library patrons? The OpenSearch specification provides web browsers with a means to auto-detect search engines, and query sites from within the browsers internal search bar. This works in modern browsers such as Internet Explorer 7+ and FireFox 2+ (pictured below). By adding OpenSearch to LibGuides, we get the additional benefit of automatic support for the popular LibX browser plug-in for libraries. For those of you not familiar with LibX, it allow libraries to create a custom browser toolbar, allowing simple searching of catalogs, databases, and now LibGuides! To see this in action you can visit the LibX Edition Builder and go to the ‘Catalogs & Databases’ tab. 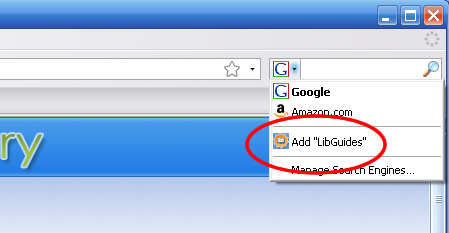 Enter your LibGuides URL into the ‘Auto Detection’ box (seen below), and the Edition Builder will add LibGuides search support to your LibX toolbar. Thanks to Godmar at LibX for helping us with this implementation! Thoughts, comments or questions about these new features? Don’t keep them to yourself – share your ideas with other LibGuides users at the Springshare Lounge.